The feature documentary film “Brooklyn Boheme” has been on my list of things to watch for quite some time. As it turns out, yesterday was the perfect day to watch it–on a day when I was completely drained of any kind of creative energy and needed a jolt of inspiration. The film, directed by Diane Paragas and Nelson George, tells the story of the African American creative arts community that developed in the Fort Greene neighborhood of Brooklyn, New York during the 1980s and 90s. 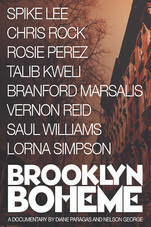 In the documentary, filmmaker Spike Lee, writer Lisa Jones, actress Rosie Perez, jazz musician Branford Marsalis, comedian Chris Rock, poet Saul Williams, activist and writer Kevin Powell, along with scores of other artists of various genres talk about the creative movement that sprung up in Brooklyn. Listening to the stories of the Fort Greene creative movement, I wondered if they knew, at the time, the kind of influence they would have on young people in faraway places Greensboro, North Carolina where I lived, for instance. Born in 1980, my real memories start in the late 80s and include vignettes of me singing to the “Good and Bad Hair” scene of Spike Lee’s “School Days,” wearing an ankh and a head wrap in middle school after Erykah Badu released her first album, watching Saul Williams perform in the film “Slam” and falling in love with spoken word, and reading Lisa Jone’s book “Bullet Proof Diva” during my first year of college and thinking I might write essays one day. Each of these artists was part of the Fort Greene arts movement and had a lasting impact on my creative references, including the music, books and films I constantly go back to for inspiration and ideas. “Brooklyn Boheme” is a great film for us black babies of the 80s and 90s to watch and remember a time when we were too young to know explicitly what was happening in the black arts scene, but old enough to be indelibly influenced by it nonetheless. The documentary is also a great for anyone—black or otherwise—to watch and take away lasting lessons for creative community building. As I’ve written in other posts this month, communities help keep creatives accountable and inspired, and one sees evidence of this first-hand when watching “Brooklyn Boheme.” Because it’s hard for me to watch or read anything without taking notes these days, I jotted down some things I learned from the film about creative community building that I think can be useful for any artist or changemaker. Go find your movement. It’s easy to look at a film like “Brooklyn Boheme” and think, “If only I had been born earlier, I could have been a part of that.” The thing is, there are really cool, innovative, creative things happening around us all the time—we just have to go find them. Creative community building is an intentional act. While the Fort Greene creative movement may have been impromptu in its birth, as playwright Carl Hancock Rux explains in the film, one can’t help but reflect on the intentionality that also existed in its development. People like Spike Lee were natives to the neighborhood and critical to its emergence, yet as others caught on to what was happening, they chose to go there and experience the energy for themselves. They found a community that inspired them and decided to go be a part of it. We may not all live in Brooklyn, but that doesn’t mean we are at the mercy of luck when it comes to being a part of something special. We can find our movement right now in creative communities all around us, or better yet, we can be the pioneers of one. Unfortunately, not all of our living spaces feature the kind of density or walkable landscapes that foster impromptu connections. Still, I think it’s possible for us to include more place-based community building in our creative lives, even if it just means holding a monthly gathering of friends to start the kind of physical community building that was so meaningful to the Fort Greene artists. If we use “Brooklyn Boheme” as a lesson in creative community building, the goal then, should be to seek out spaces where we find our people—the people who inspire us and push us to believe greater and higher things about our art and our ability to create beautiful and meaningful things. And, if we happen to be the ones who notice the lack of that kind of community in our immediate surroundings, we might have to build it. Brooklyn Boheme – Official Trailer from Diane Paragas on Vimeo.